Tin Can Daisy: What do you do with this? This was one of those Op shop finds that you can't leave behind but have no idea what to do with :) There were actually 2 pieces of this fabric - they were curtains. But when I got home I found the lady had only put one in the bag......whatever happened to the other one?.......hmmmm. Anyway - I keep thinking I could make shorts out of the forest section but then what would I do with that huge whale? It seems a shame to throw him out. I could make a huge cushion, but I have a tiny house and a huge cushion would take up our whole floor! Maybe this one is destined for a swap.....or Ebay.......or maybe it'll just sit in my cupboard forever to be cleaned out by my great grandkids when they pop me in the nursing home LOL. Hey...I just wanted to thank you for yout very clever name suggestion for my mannequinn! I think you were the most creative of the bunch...and the only reason I coudln't choose Mabel Twilly is because I once had a big fat Persian cat named Mabel, and It just didn't work for the mannequinn because of that! You know how it's hard to name someone a name you had for a pet??? Anyway, it still deserves a big high five for being really awesome! Thanks for visiting my blog and de-lurking. Welcome to blog land too - I am sure that you will enjoy it. Yes 22222 visits is huge - but I have been blogging since 2006 and I am certain that more than half of those visitors are family and friend that NEVER comment LOL. Love th fabric and the comment about leaving in the cupboard for the grandkids to find later on! I am sure that I will be doing that at my Grandmothers. What about a wall hanging. It looks so fabulous you have to display it somehow. Or what about a set of kindy sheets, or a beanbag. 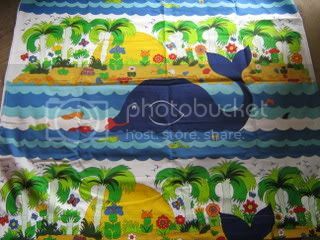 Otherwise I would go with cushions and maybe make them smaller even if mr whale gets chopped in half they would still be fabulous. I never thought of a wall hanging :)That's a great idea.